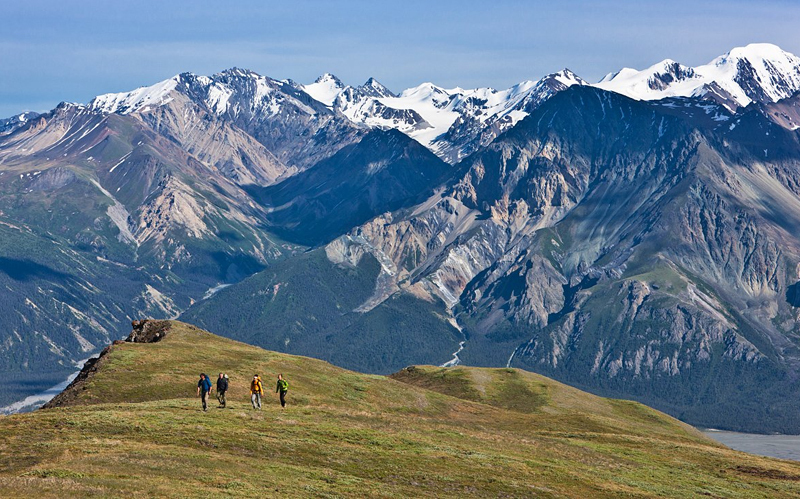 Kluane National Park and Reserve is located in the southwestern corner of the Yukon, and is a park of natural wonder. Visitors will be in awe of the natural landscape, full of mountains, large icefields, and valleys. The park protects the greatest diversity of plant and wildlife in northern Canada and is also home to the highest mountain in Canada, Mount Logan. The protected regions of Kluane National Park & Reserve, join with Wrangell-St. Elias and Glacier Bay National Parks in Alaska, and with the Tatshenshini-Alsek Provincial Park in British Columbia to form the largest international protected area in the world. Slims River flows from the Kaskawulsh Glacier in Kluane National Park and Reserve. The park was established in 1972. Much of Kluane National Park and Reserve is cold and dry, though some areas in the southeast are known for more precipitation. Summer is a great time to visit as the temperature is warm and visitors have more opportunities with longer days of sunlight. In fact, the park can get up to 19 hours of continuous sunlight; imagine all you could do in a day! Avoid trips in the winter as the park gets as little as 4 hours of sunlight. Keep in mind that mountain weather is highly unpredictable. Rain or snow can occur at any time of the year and freezing temperatures are possible, even during the summer. Visitors should prepare for all conditions and have extra gear, just in case. Haines Junction is Kluane National Park and Reserve's hub and where visitors can find the Visitor Center. It is also the best place to find restaurants, motels, hotel, service stations, and other amenities to make your trip easier. Visitors can reach Haines Junction by driving west of Whitehorse on the Alaska Highway (Highway 1), or by driving north of Haines, Alaska on the Haines Road (Highway 3). If you are traveling from Anchorage or Fairbanks, take the Alaska Highway south to Tachäl Dhäl (Sheep Mountain). The park has been home to Southern Tutchone people for thousands of years and it's no surprise why. With stunning views of mountains, lakes, rivers, the park is a perfect place for scenic hiking and backcountry adventures in the mountains. A variety of activities await visitors, such as camping, hiking, guided walks, mountain biking, horseback riding, and mountain climbing. Water activities include fishing (license required), boating, canoeing, and rafting on the Alsek River. Winter activities include cross-country skiing, snowshoeing, dog sledding, and snowmobiling. Camping is encouraged in the park. The best location is Kathleen Lake - a 39-site campground with firewood, bear-proof storage lockers, and outhouses. Sites are first come-first serve and are available from mid May to mid September. Keep in mind that bears are common in the park. Brush up on your bear safety before visiting.